How much new business would £120 of Google traffic generate for you? Call 01509 631136 or email us at [email protected] to find out! As a high profile Google Partner we are able to offer up to £120 in matched funding towards new AdWords accounts to get you started. Google have extended this offer again to 30th September now! Do you wonder whether your business is ‘getting’ the internet? Do you have a sense that somehow your competitors are doing it better? Do you feel everybody else is doing something that you are not? Try our FREE AdWords PPC calculator to see what the returns could be in your sector. Well, you are not alone, many businesses, both large and small under-use the vast potential of the internet. Unlike traditional forms of marketing, the internet allows you almost instant access to potential customers, who by the very nature of their search are already interested in your offering. As well as being a relatively low-cost form of marketing, the internet allows you to build a profile and relationship with your customer base, building a brand and loyalty. It is estimated that 94% of internet searchers do not go beyond the first page of results, so if your website is languishing somewhere on page six, frankly, it is unlikely to be seen. This of course means competition for a first page result is fierce and there are lots of contributing factors which work together to achieve a first page ranking, including search engine optimisation. 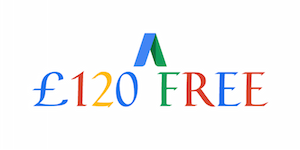 Get £120 Adwords credit from Studio-40. How much new business could you generate with that? Find out today. One way to achieve a first page appearance is through AdWords. This is Google’s own way of ensuring a first page result and allows businesses to place a search results advert, which appears when someone searches using words linked to their service or product. The advert is only paid for if someone clicks it, this is also known as pay per click or PPC. The advantages are clear, your business placed right in front of a potential customer who is already searching for what you have to offer! With options for choosing when and how often the advert appears, a digital marketing expert is best placed to devise a simple campaign that can maximise your budget and ensure the best return on investment. 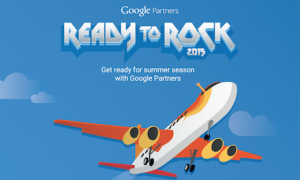 Through their partners, Google have launched a new scheme called “Ready to Rock”, aimed at businesses that would like to improve their online presence but firstly want to test the waters. Offering £120 in matched funding, this scheme allows businesses to see the benefits of an AdWords campaign in a low-risk way. Here at Leicestershire based digital marketing agency, Studio-40, we have been selected to offer this matched funding to new clients. As a Google Partner, you can rest assured you will be in safe hands, not only has our digital marketing team had to work really hard to gain Google Partner status, but with 6,000 (and growing!) AdWords conversions each month, we have plenty of experience. Boosting a web profile does not happen overnight and there are lots of techniques that work together to help create a solid online presence. However, If you would like to get started and see where an improved Google search result can take your business, call the team on 01509 631 136 or email [email protected]. The offer ends, 30th June! Now extended (thanks Google!) to 30th September! Don’t forget to try our FREE AdWords PPC calculator to see what the returns could be in your sector. Studio-40 are a verified Google Partner which means that all of our team have met and surpassed the requirements to manage AdWords expertly. We are fully supported by dedicated Google account managers to help keep our skills sharp, and to offer our clients the best possible service. You can view our Google Partner profile here.